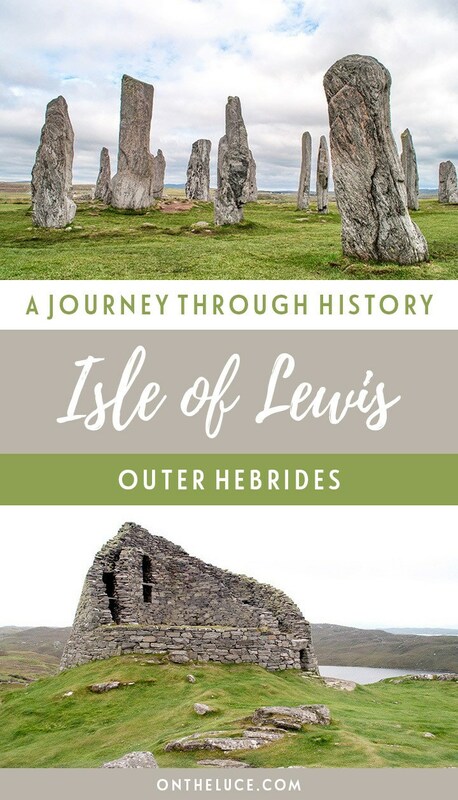 History is all around you on the Isle of Lewis in Scotland’s Outer Hebrides, and no where more so than on the island’s west coast. The road that runs along the coast takes you though some stunning scenery. 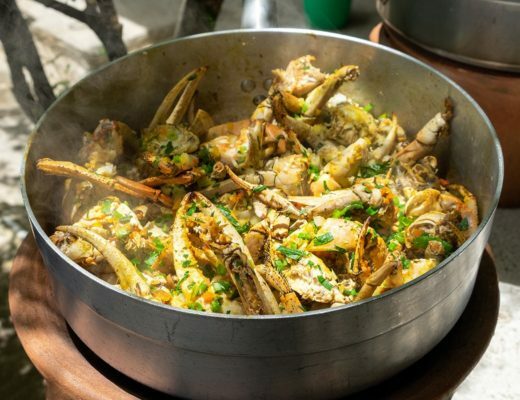 But it’s also a journey through the different eras of the island’s 5000-year history. Within 16 miles you can travel through 4000 years, from modern island life way back to Neolithic times – but what’s along the way? 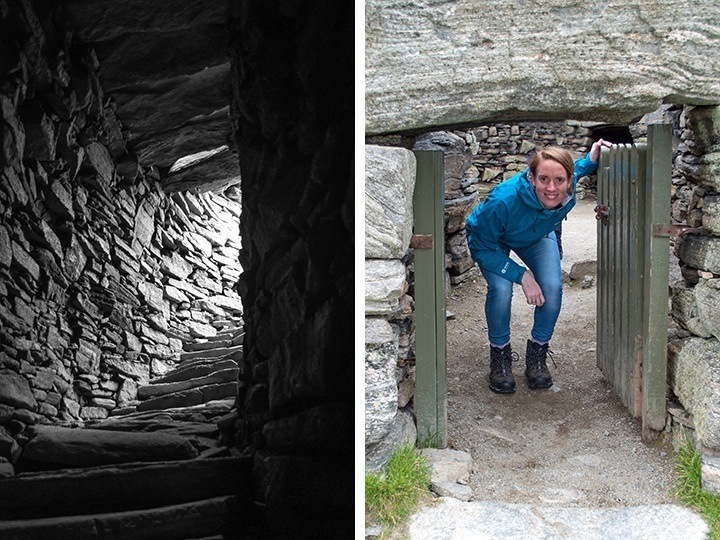 Our first stop at the Arnol Blackhouse took us back just over a century. 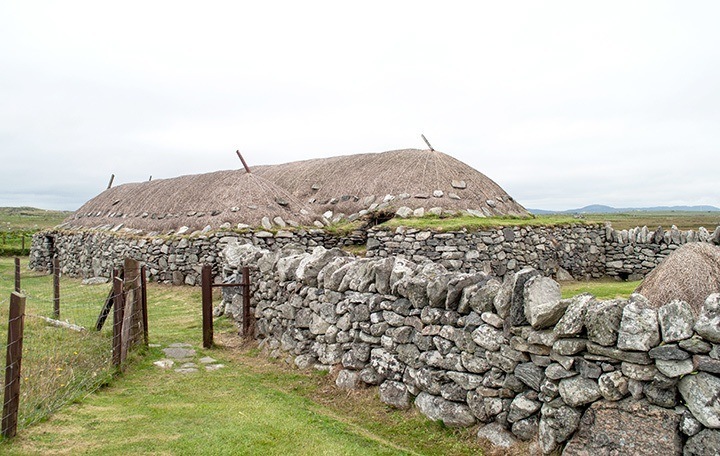 Blackhouses are traditional stone houses where crofting families lived with their animals. They were built to withstand the harsh Hebridean winters. So they’re low to the ground with thick walls insulated with peat and earth, and a heather and straw thatched roof. At first sight the blackhouse could be centuries old, but in fact the last people living here only moved out in 1966. No 42 is the last blackhouse left in Arnol and it’s preserved just as it was when the family moved out. 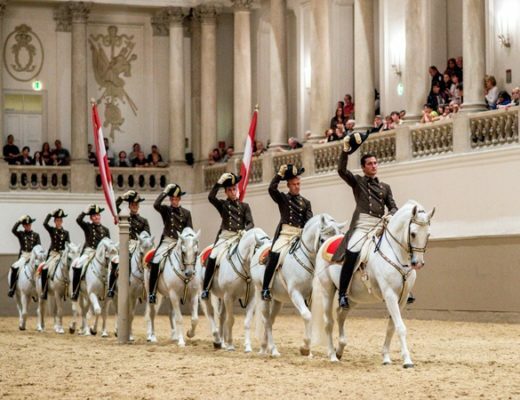 It’s a snapshot of a unique way of life that’s now passed into history. The first thing you notice when you duck through the low door into the blackhouse is the smoke. Thick peaty smoke fills the air, and pretty soon your lungs too. The kitchen was the centre of the house and the fire was the centre of the kitchen. The Gaelic word for the room ‘aig en teine’ means ‘at the fire’. The fire was never allowed to go out and was where the family would eat and socialise. There’s no chimney so smoke quickly fills the house, but it kills any bugs in the roof and old sooty thatch makes good fertiliser. The second thing you notice is the darkness. The doors and small windows are the only sources of natural light. But as your eyes become accustomed to the dark (and stop watering from the smoke) a cosy home emerges, with wallpapered walls, wooden box beds and dressers full of crockery. The family lived here for 80 years until new regulations meant crofters had to separate their homes from their animals. So they started building more modern ‘whitehouses’ instead. Wandering around the museum’s 1920s whitehouse you can’t imagine what a change it would’ve been – a whole new way of life not just a new place to live. A few more miles along the coast took us a lot further back in time to the first century AD at the Dun Carloway Broch. 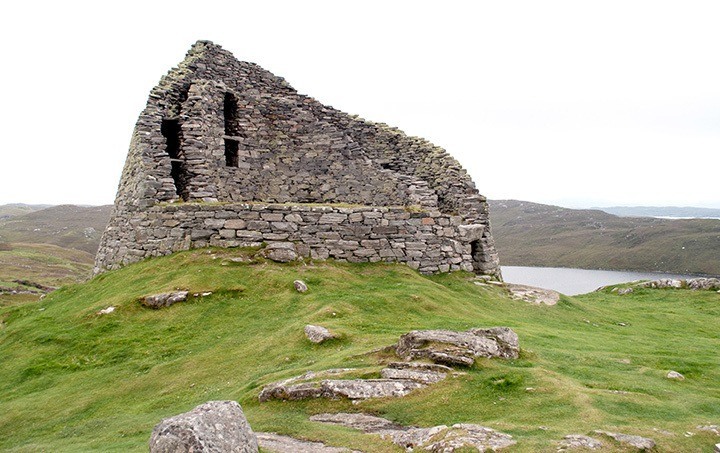 Brochs are a type of drystone-walled Iron Age tower that’s are only found in Scotland. Historians think they were built as defensive fortifications. Or maybe they were the stately homes of their day, built to show off the owner’s wealth and power? The truth about their origin is still a bit of a mystery, but either way Dun Carloway is one of the best-preserved brochs in the country. To reach the broch you climb up a pathway up through the heather. 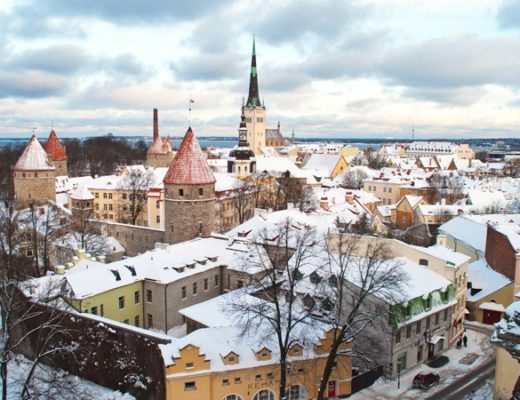 Its hilltop location makes it an imposing sight, and it must have been even more so when it was at its full 13-metre height. The original conical roof and the wooden floors are long gone, but the skillfully built walls have lasted the distance. There were multiple floors with the animals living down below and the people above them. One side has fallen away so it’s almost like a cross-section cutaway where you can see what lies underneath. If you duck down you can climb inside and scramble through the old doorways and the narrow gap between the two layers of wall (though watch your head – I speak from experience!). There was originally just the one tiny doorway where a guard would sit to make sure there were no surprise attacks. Years later the broch was used as a watchtower for defence against a Viking invasion, and people living in it as recently as the 1870s. But now Historic Scotland have taken over ownership and are preserving it for the future. 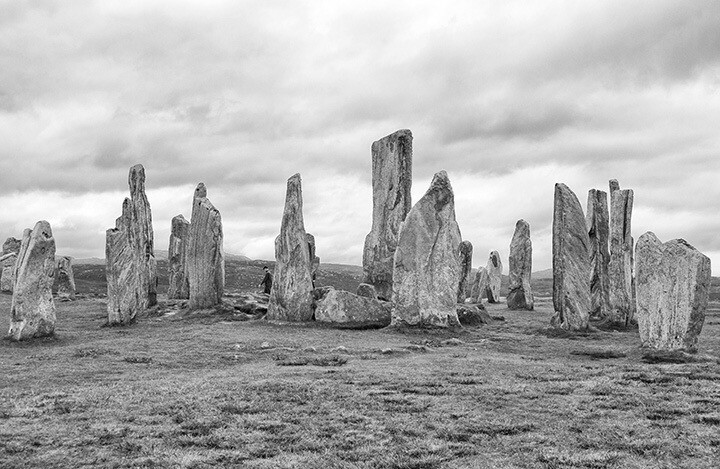 The Iron Age might seem like a very long time ago, but the Callanish Standing Stones are over twice as old. If you’ve been to Stonehenge and peered across the rope barrier, then these stones are older, more impressive and you can go right up to them run your hands across their rough surface. Each stone is a different shape and size, cut and moved here by hand 4000 years ago. Why they were put here is another mystery though – was the site an astronomical observatory or maybe a place of worship? 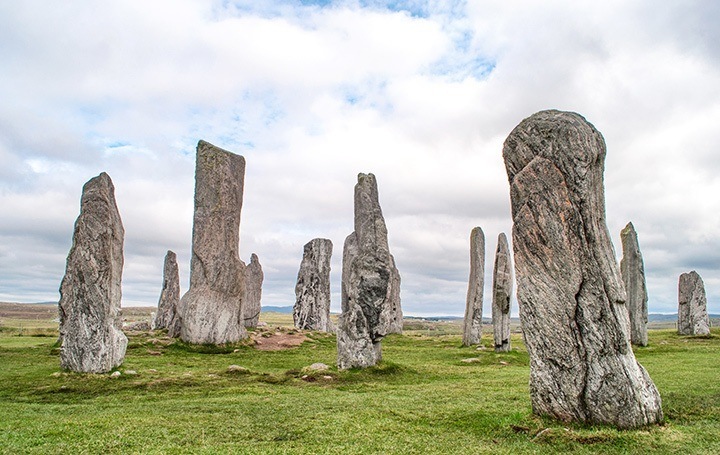 There are actually 20 different monuments around Callanish, but the biggest is the group of 50 stones near the visitors centre. It looks like a circle with lines of stones radiating out, but from the air you can see they form the shape of a Celtic cross. Some stones are big thick slabs of rock over 15 feet tall and others are thin, delicate pieces that look like you could just push them over. But they’ve all stood here for thousands of years and made it through invasions, wars and winter storms. Now that’s serious staying power. 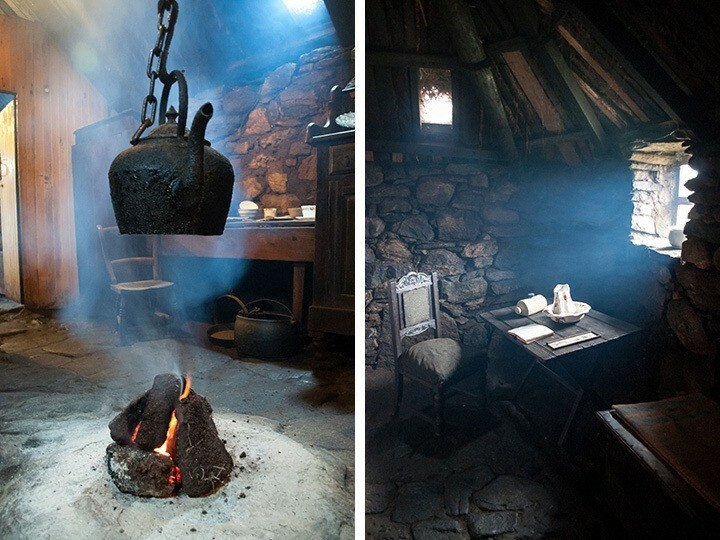 The Arnol Blackhouse is open from Monday to Saturday, 9.30am–5.30pm (10am–4pm and closed Wednesday and Sunday from October–April). Entry costs £5 for adults, £4 for over 60s and £3 for children aged 5–15. The Dun Carloway Broch and Callanish Standing Stones are both free to enter. 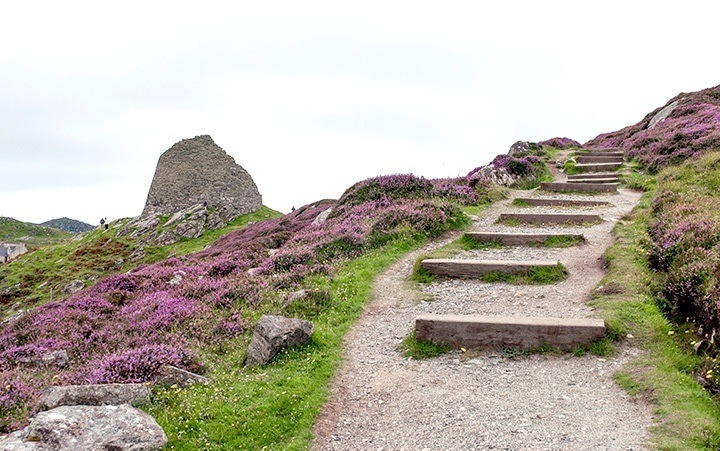 Dun Carloway Visitor Centre is open 10am–5pm from April to September. Calanais Visitor Centre and café is open Monday to Saturday from 9.30am–8pm from June–August (10am–6pm in spring/autumn and closed Mondays in winter). Thanks, it is a really beautiful spot! Very evocative, Lucy, the echoes of past lives were coming through in your words and images! Thanks Sara, I was really fascinated by all the history around us on the island, it’s such an interesting place. Amazing! Scotland really does have some beautiful places! It certainly does – I’ve got a very long Scotland wishlist! Thanks Jo! So much to see in Scotland – now my sister is up in Edinburgh it makes it much easier to explore having a Scottish base (I’ve reserved her sofa for half of next year!). Oh, this took me back! I loved visiting Lewis 3 years ago (our dog is named Lewis in its honour!) and you’ve captured it perfectly. I would love to see the stones- so fascinating and amazing to be able to get so close. I’m so used to seeing things fenced off it was lovely to be able to get up close to them! So much history in such a desolate – place. I find the stones fascinating and strangely haunting. I’ve seen some lovely shots of them at sunrise and they look really haunting (unfortunately not my best time of day!). It was so pretty – and definitely somewhere that deserves to be better known (though it’s nice not to have any crowds!). I plan to visit Isle Lewis. 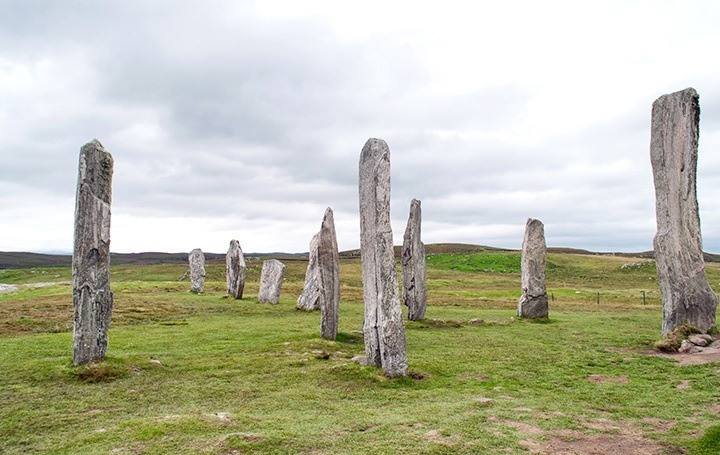 Around 2000 BC (or before) the Minoans built the stone circles as a means to help them develop latitude tables by reading the position of the sun, moon and stars on Lewis at various times of day and night. They developed latitude tables so Minoans could sail down the latitude and find Lewis on their way back from America after a copper run. in Lake Superior. They had had a village on Lewis to support the Minoan sailors and the boats on their way home to Create. Minoans also had works on St. Kilda. Such a fascinating history! Hope you enjoy Lewis, it’s a very special place. 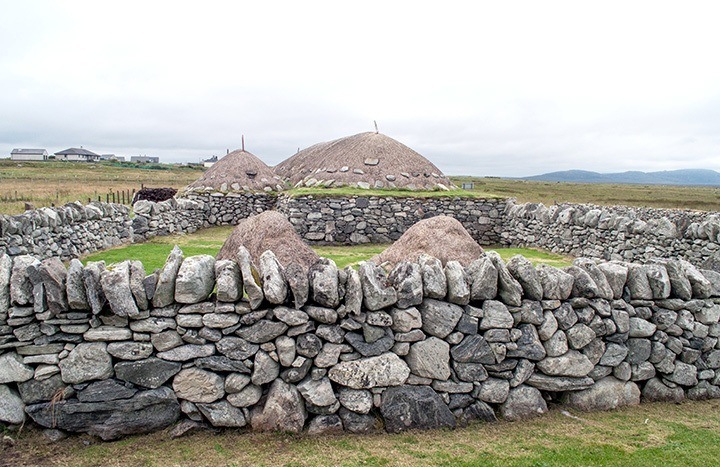 Thank you for including my comments about the Minoans erecting the Bronze Age stone circles at Lewis. The Minoans needed to create latitude and longitude sailing tables so they could observe celestial bodies aboard their boats at sea in order to find their way home from America. Lewis was close to America on the Gulf Stream route and acted somewhat like a bronze age light house. I should ad that the Minoans learned much about the sun, moon and stars from tables created by the extraordinary Babylonian mathematicians and astronomers who existed in the Mediterranean during the same bronze age period as the Minoans.